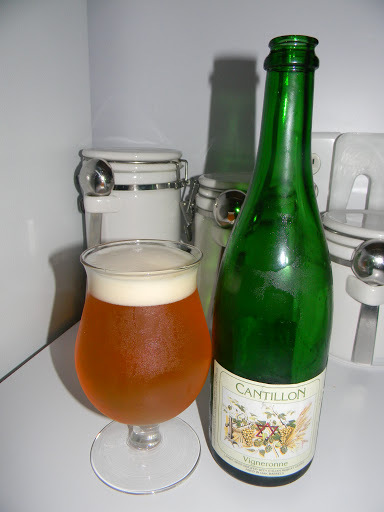 Cantillon | Beer Apprentice - Craft Beer News, Reviews, Interviews and Info. Hello everyone. For today’s craft beer review I’m going to be trying a Cantillon Vigneronne (2011) produced by the Brasserie Cantillon located in Brussels, Belgium. I very rarely am able to find anything by Cantillon, so I’m super excited about trying this beer. The website, cantillon.be, has a very lengthy description of this brew, so I’m just going to post a small excerpt. Vigneronne is a blending muscat grapes and lambic, the brewers and beer merchants produced the “druivenlambik” (grapes lambic). White grapes soaked in lambic. The fructose, which abounds in these fruits, enables us to make a beer which is more mellow than the Gueuze or the other fruit beers. The spontaneous fermentation, the ageing in the barrels for several years and the addition of grapes make it a distant cousin of certain white wines. Changed name from Druivenlambik in 1987. Let’s enjoy this fine brew, shall we? This beverage comes in a 25.4 oz. bottle and it has an ABV of 5.0%. It poured quite clear with a orange color. The crown was barley off white and kind of fizzy. The size was somewhat small, which surprised me because I gave it a fairly aggressive pour. The retention time was slight and it hardly left any lacing behind as the head settled. The nose was very nice. A lot of grassy notes combined with a (good kind of) mustiness. Hints of acidic lemon citrus, white grapes and sour green apples. It also smelled a little bit tart with a light barnyard funk. The nose wasn’t extremely loud, however it was very well balanced and defined. The overall bouquet was very pleasing to say the least. The taste was outstanding!!! It started with a very pleasing and manageable sourness, which moved to a kind of lemon “sweet tart” flavor. Savors of white grapes and yeast stepped up during the middle and the musty funk really seemed to ascend even more than it did in the aroma. Phenomenal, I must say. The mouthfeel was medium bodied. Very dry, crisp and a touch sharp and bitey. The carbonation was great and a lot of flavor was left covering the entire palate after each intake. Yep… this is an excellent beer. The appearance wasn’t all that impressive, but the nose was great and the taste was “world-class”. The drinkability was spectacular too. I tried to take my time with it, but I found myself taking huge gulps. This Cantillon Vigneronne is easily worth a try if you can obtain a bottle. I think even the most advanced craft beer drinker would be pleased to have this on hand at all times. I know I would. Have you guys ever tried this beer? Did you like it? Feel free to leave a comment and tell me your opinion of it. For today’s craft beer review I’m going to be trying the Cantillon Cuvee Saint-Gilloise produced by the Brasserie Cantillon located in Brussels, Belgium. 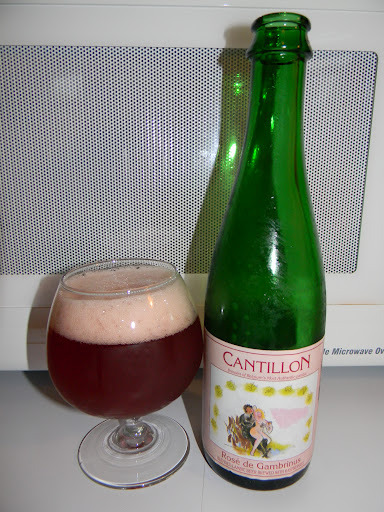 From the website, cantillon.be, I couldn’t find any sort of description of this particular beer, nor could I find anything on ratebeer.com so let’s just get it poured and see how it is. This brew comes in a 25.4 oz. bottle and it has an ABV of 5.0%. It poured a hazy, deep orange to light amber color. It had a white head that formed to a decent size. The texture was a touch soapy and soft. The retention time was only average and the lacing looked pretty decent for the first few drinks. After that it just left a few patches then finally dissipated completely. The aroma was….. awesome!!! A distinguished, exceptional, balanced and complex fragrance of yeast and bread intermingled with a nice bit of that barnyard funk. Subtle acidity from a white grape and light green apple essence. It also had a mellow but well blended touch of wood as well. A beautiful bouquet. World class in my opinion. The flavor started nice and tart with a phenomenal, but restrained sourness and funk. The wood came on superbly after a few sips. It kind of tasted like a sour apple jolly rancher. The flavor also had a predominant bready/yeasty component with a grassy/hay undertone. Very impressive to say the least. The mouthfeel was medium bodied. Bone dry, firm, snappy, crisp, refreshing and thirst quenching. The carbonation was very good and lively and a ton of flavor was left behind on the palate begging me to take another sip….. which I proceeded to do. Uh…. yeah. What a great beer. What else needs to be said really? This thing only got better and more defined as I went along. The drinkability was top notch. I tried not to rush through this, but I couldn’t help it considering how good it was. The only thing that I may gripe about was the appearance. I’ve seen better looking beers, but as we’ve said before, the appearance is definitely not the most important aspect of any beer, much less one from Cantillon. 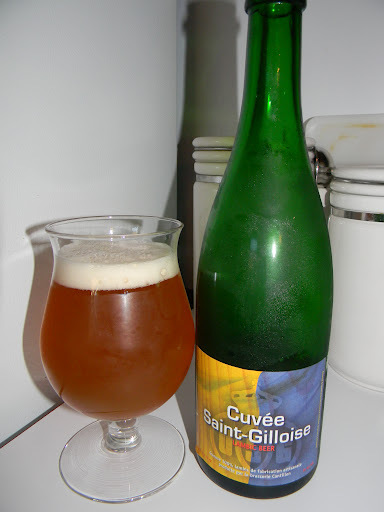 So, if you guys haven’t had the Cantillon Cuvee Saint-Gilloise I’d highly recommend you try it. It doesn’t disappoint. If you have tried it let me know what you thought. I’d love to hear from you.